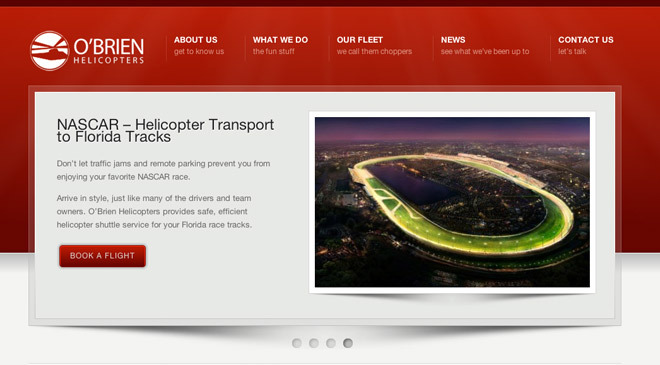 We just completed a new website for O’Brien Helicopters, an helicopter charter service based in Fort Myers, Florida. They operate the luxury twin-engine Agusta 109A and Bell 206 Jetranger helicopters and provide services such as aerial surveying & scouting, aerial photography, powerline/pipeline patrol, executive charters, disaster relief and more. Brian Joseph Studios developed a strong online presence for them to expand their reach and start attracting business beyond word of mouth and client referrals. If you are ever looking for a helicopter charter in Naples, or a helicopter charter in Miami, please consider O’Brien Helicopters.